Here is Some Information about Vaikom Mahadeva Temple in Vaikom Kerala India. 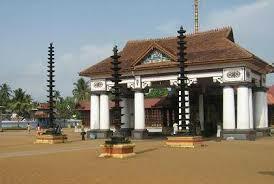 The Vaikom Mahadeva Temtple is located in Vaikom Dist: Kottayam, Kerala.The main deity of the temple is Lord Shiva. 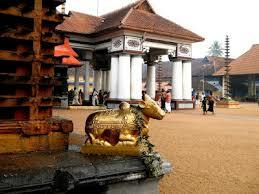 The temple makes an influential trio with Ettumanoor Siva Temple, Kaduthuruthy Thaliyil Mahadeva Temple. It is said that visiting all the three temples in a day makes the wishes come true. The priests at the temple come from Kadathanadu in Vadakara Taluk of Kozhikode District and other works are done by Moosad of the East and West families. At the south side of the temple yard, the idol of Panachikkal Bhagavathi is kept to worship. The Sarppa Sanidhya, the God of Snakes, is also worshipped within the temple. 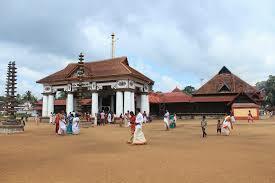 Travancore Devaswom Board takes care of the appointments of rest of the employees of Vaikom Sree Mahadeva Temple. One of the bigger temples in Kerala, the Vaikom Mahadeva Temple has a courtyard of about eight acres of land. The premises levelled with river sand is protected by compound walls with four Gopuras or towers on all the four sides. The temple faces the East. Near the east Gopura there is a protected platform where a pipal tree, a mango tree and a jackfruit tree all grow together. Presently only pipal tree is alive. The great Shaivopasak Vyaghrapada Maharshi is said to have done penance and pooja here and it is in the same place he got Siva-Sakthi Darsana and Athmasashathkar or fulfillment, and this place is known as Vyaghrapada Sthana. The golden flag staff is really a pride of the temple. Then we enter Balikalulpura(the place of the sacrificial stone) where Stambha Ganesh is seated at its north-east corner. Walking further we enter the Namaskara Mandapa. The story of Ramayana is sculptured on the inner roof. For the main offerings of Vaikkathappan such as Dravya .Kalasa, Margazhi Kalasa poojas are performed and Veda Manthras are recited from here. A huge Nandi made in a single stone together with a small one for Archana are in the east of this Mandapa. Passing through the stone laid inner way we reach the Sreekovil or The Holy of Holies of Shree Vaikkathappan – the Annadana Prabhu who fulfils every desire of His devotees. As per the popular legend associated with the establishment of Vaikom Temple, Kharasura offers prayers to Lord Shiva at Chidambaram. Impressed by his devotion, Lord Shiva presents three holy Shiva Lingams to Kharasura. Assuring him to be present in these Lingams, Shiva suggests Kharasur to worship them to get Moksha (salvation). He moves towards south from Himalayas holding two of the Lingams in each hand and the third one in mouth. He feels tired and stops at Vaikom. Keeping the Shiva lingam on the ground, he rests for a while. After resting, he realizes that it has been affixed at that place. Therefore, he installs the other two Lingams too, one each at Ettumanoor and Kaduthuruthy. A heavenly voice says ‘I should remain here to offer Moksha to devotees, who require it’. He understands that it is Shiva’s Maya. After getting Moksha, he hands over the supervision of holy Lingams to Maharshi Vyaghrapada and tells him to protect and worship them. 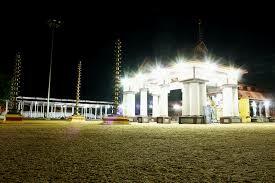 By Road : There are many public and private vehecals available to reach Vaikom Mahadeva Temple . By Rail : The Nearest Railway station is Vaikom Railway station. By Air : The Nearest Airport is Kochin International Airport .